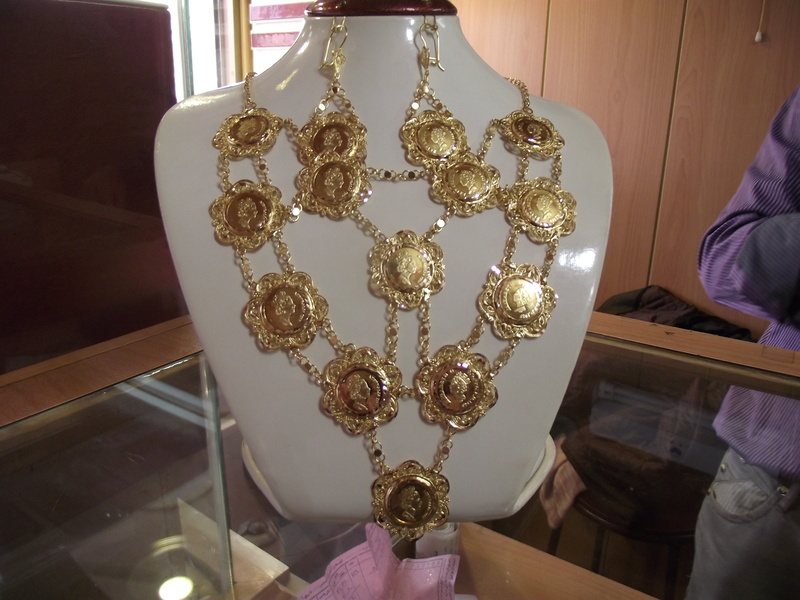 Walking down the street in Sede, I noticed a rather flamboyant gold necklace in the jeweller’s window. I couldn’t help but notice it as it is made up of several gold medallions all of which have the Queen’s head stamped on them. Not only did it catch my eye due to its design, but there was something not quite right with it. I stood and pondered for 5 minutes until I twigged that the Queen’s head is the wrong way round. Instead of facing right to left, she is facing left to right. Then came the question. Why? Is it because they made a mistake? (most likely) Is it because only licensed products can display the Queens head from right to left ? (not sure that this would worry the manufacturers over here) or is it simply that because books are read from left to right, it seemed logical for the Queen to be facing that way? (Mmmm….brain working overtime again). I don’t know the answer but it doesn’t matter. These necklaces are apparently selling like hot cakes and the Iranians love them. Again, the question to the jeweller was “Why”? (I think he was fed up with me by now) I was expecting answers such as the Olympics, the Jubilee, or just because we love the Queen but he just didn’t know. And why should he when his necklaces are flying off the shelves? I don’t know the answer to that one but one thing I do know, I won’t be buying one anytime soon!